Tecno Mobile is on it again as they recently kickoff their new TECNO Spark 3 Light Up Your Dream competition that followed immediately after the release of the wonderful smartphone. This competition can turn your love for Tecno smartphone into a fortune for you. If you have been following Tecno mobile on social media you will remember that they have organized similar competitions on several occasions. The introduction of Tecno Spark 3 has once again trigged the competition, giving you another opportunity to become a millionaire. Yes, you heard me right, I mean you can WIN 1 million doing nothing. 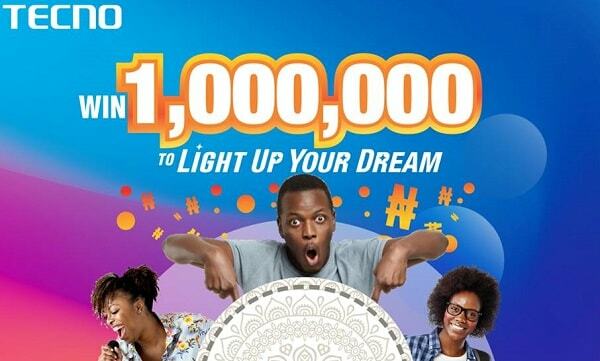 Tecno has mapped out N7,000,000 Naira to be won in the TECNO Spark 3 Light Up Your Dream competition promo and will be giving out Tecno Spark 3 smartphone to one lucky winner on a weekly basis. It's time to try your luck and you could be among the potential lucky winners but the question is how? The Obvious truth is that not all Tecno mobile fans and users will be able to win this competition but who knows if you are the chosen one. The real question is how to be part of this game and i know you need an answer to such question but no need to worry, I have a simple and straight answer for you. However, if you don't have enough time with you can visit Tecno mobile Facebook page for more info on how to join the competition and stand a chance to win Tecno Spark 3 or 1 Million Naira. Follow this instruction below and try your luck. Step 1: In a few words, TELL Tecno mobile your dream, SHOW them with an image or video what your dream is and DESCRIBE How 1 million Naira will help you achieve it (Do this on their Facebook page). Step 2: In the comment section on their facebook page, Post your entry using the hashtags #LightUpYourDream3 and #TECNOSpark3. The competition runs from April 3rd to May 17th. Terms and Conditions apply.